The end face of traditional wedge-shaped lens shall be coated with high-permeability membrane to decrease the light reflectance to the lowest. The special geometric shape of oblique wedge-shaped lens makes a reflection angle formed between the cylindrical lens and laser chips under the precondition of not affecting optical path transmission, efficiently avoiding the influence that reflecting fiber causes to the service life of laser chips and eliminating signal noise that reflected light causes. Compared with the traditional process，oblique wedge-shaped lens reduces the cost problem caused by low proportion of coated membrane and reliability problem caused by the process of coating membrane for a long time. 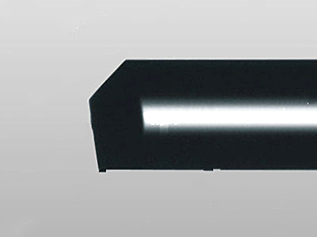 Oblique wedge-shaped lens is produced by finishing the fiber end face to be oblique wedge-shaped with precise finish equipment of Chuxing, and then optical micro-column lens is produced on its cusp with special processing procedure with the purpose of making the overall shape of fiber facula elongated to match facula of PUMP laser.